In an effort to win the war on bots, online ad exchange OpenX is enlisting people -- and some machines too. Calling it a “dual human and automated” system, the company unveiled a new monitoring system enabling advertisers, agencies and trading desks to track and manage the quality of their programmatic audience impressions in real-time. Citing a recent comScore analysis, OpenX said the amount of “non-human” traffic being generated and served to advertisers via programmatic audience buys is “material,” and added that the new quality control system was built specifically to deal with the problem. 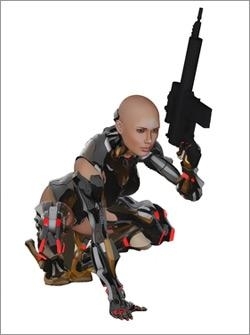 "Robo Girl" image from Shutterstock. 3 comments about "OpenX Opens New Front In War On Bots: Puts Humans On The Line". George Simpson from George H. Simpson Communications, August 28, 2013 at 9:48 a.m.
Broadcast Interactive Media just spun off a new company, MdotLabs, that will help advertisers, demand-side platforms, and publisher networks ID and avoid invalid traffic which is now costing the online ad ecosystem over $10 billion every year in wasted ad spending. In one of its first studies, MdotLabs found that a significant percentage of the top 100 online advertisers are being victimized by PPV networks that perpetrate traffic fraud. Bobby Campbell from Adkarma, August 28, 2013 at 11:42 a.m.
Glad to here that there continues to be a concentrated effort across platforms to put a stake in this issue. The more that we work together to stop this activity the better it is for everyone. Sam Schwarz from GOAT analytics, August 28, 2013 at 3:35 p.m. The only companies capable of defending against massive Bot attacks are F5, Solve Media, Cisco and maybe Symantec. Everything else is child's play.